Entretanto manutenção de motores para os M60 egipcios por 19,6 milhões de dólares. E 7,2 milhões para manutenção dos M88 americanos. The MD Helicopters Inc. (MDHI) MD 530F Cayuse Warrior light attack and reconnaissance rotorcraft operated by Afghanistan are to be upgraded to improve their safety, range, and endurance. The US Army disclosed on 16 January that it is seeking vendors to supply and install crashworthy and auxiliary fuel tanks in 25 of the 'Little Bird'-derivative helicopters delivered so far to the Afghan Air Force (AAF). "The US Army Contracting Command - Redstone is issuing this sources-sought notice as a means of conducting market research to identify parties having an interest in and the resources to provide up to 25 MD 530F Robertson Crashworthy Fuel System (CWFS) and Little Bird Auxiliary Tank System (LBATS) kits, and three support equipment packages for the Afghanistan Air Force", the solicitation said. The AAF currently fields 30 MD 530F helicopters, and will receive a further 25 before the end of the year. The first 25 helicopters received have been fitted with the Enhanced Mission Equipment Package (EMEP) that includes the baseline Robertson Fuel System, while the initial five of the 30 follow-on helicopters were delivered with the Ballistic Tolerant Crashworthy Fuel System (BTCWFS) developed by Robertson (this will be fitted to the remaining 25 helicopters also). As such, this latest US Army request for information (RFI) is for a retrofit of the first 25 helicopters delivered to the AAF. While the Afghan helicopters are adapted for 'hot and high' operations with an uprated 650-shp Rolls-Royce 250-C30 turbine engine and longer main and tail rotor blades, when operating at altitude with a full weapon load they currently lack the range to venture too far beyond their operating base or the endurance to remain on station for any significant length of time; MDHI figures give the baseline MD 530F a range of 400 km and an endurance of 2.2 hours at sea level. 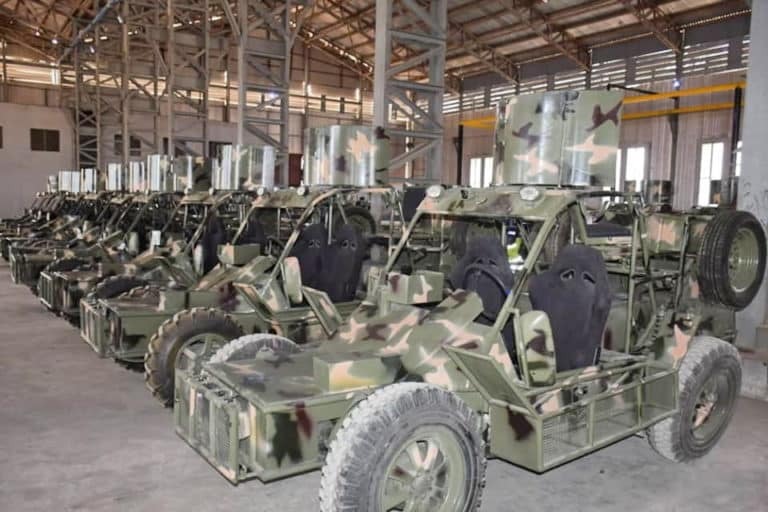 The Nigerian Army is domestically manufacturing a light military patrol vehicle at a new facility that was recently launched by the head of the Army. Chief of Army Staff Lieutenant General Tukur Buratai on 26 January formally commissioned the Nigerian Army Vehicles Manufacturing Company (NAVMC) at Rigachikun in Kaduna state, although the company was set up on 16 November 2018. A tour of the factory was carried out and took in the NAC-V (infantry patrol vehicle), B vehicle assembly plant, fitter machine plant, engine overhaul shop, engine test bay, fabrication, painting and spray shop and foundry and metalsmith shop. 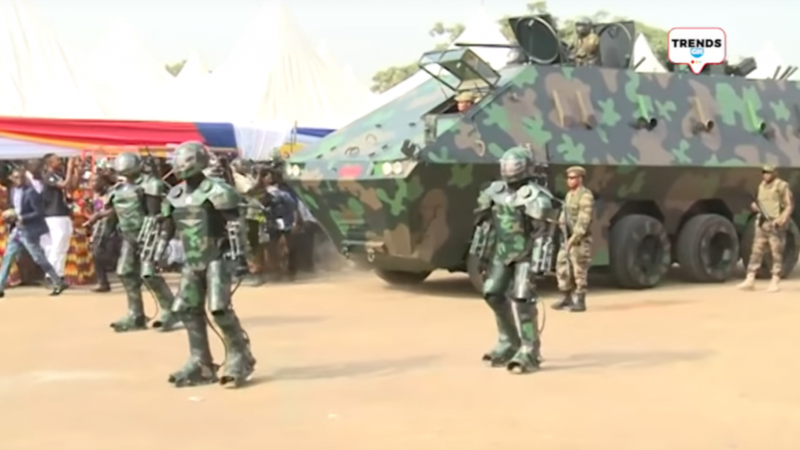 The Nigerian Army said that production had begun of prototype light and heavy infantry vehicles and Buratai commissioned some refurbished A and B vehicles. These included Otokar Cobra light armoured vehicles, a BTR recovery vehicle, and an MT-LB tracked carrier. Whilst the standard Mistral ATLAS system is a manually operated twin missile launcher, the new ATLAS-RC system provides greater protection to the crew, since it can be operated from within the vehicle’s cabin or, remotely, through a state-of-the-art fully mobile workstation.Its 360° revolving, motorised turret is easy to operate, provides an optimised operational capability while at the same time keeping costs to a minimum. ATLAS-RC is compatible with all versions of the combat proven Mistral missile and benefits from its many performance advantages. These include: fire-and-forget capability; high reliability; exceptionally high kill probability against fixed and rotary wing aircraft and UAVs. Mistral incorporates the ultimate in state-of-the-art technology to ensure optimum effectiveness, such as a full imaging IR seeker which provides a very high resistance to IR countermeasures as well as the ability to engage low IR signature targets. Mistral ATLAS-RC is MBDA’s response to today’s requirements for a weapon system that combines high re power, short reaction time, day/night surveillance and engagement capabilities, tactical and strategic mobility, together with a high level of crew protection. crew workload and number (it can be operated by one single soldier), to be easily integrated on a wide range of high-mobility armoured or non-armoured combat vehicles and to be air transportable on aircraft such as the A400M and C130. MBDA is promoting the ATLAS-RC/LIC2ORNE combination at IDEX this week. 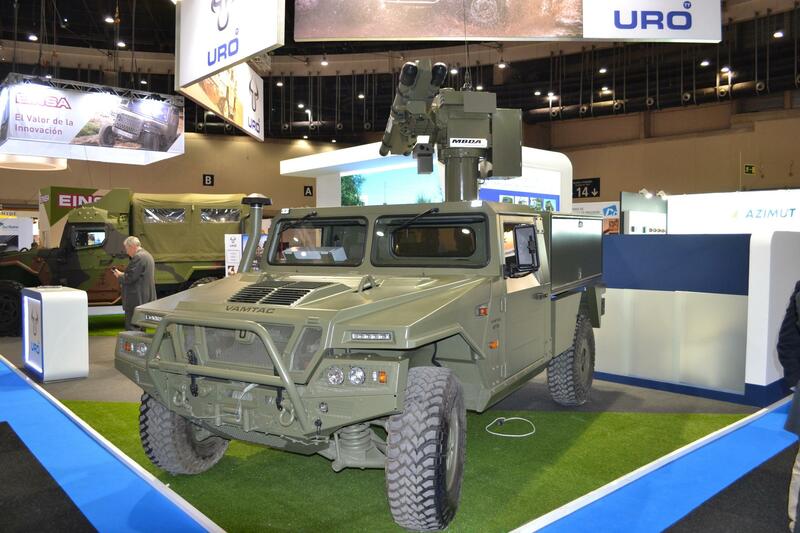 Used in tandem with the MISTRAL short-range air defence missile, the combination offers substantial protection to mobile units, carried on light armoured vehicles while also integrating into the theatre air defence network. The MISTRAL is an extremely reliable fire-and-forget air defence missile, with a success rate of nearly 95%. Equipped with an infrared imaging seeker and advanced image processing capabilities, the missile offers excellent countermeasures resistance and can engage low thermal-signature targets such as UAS and turbojet-powered missiles at long range, in addition to the usual combat aircraft and helicopter targets. The ATLAS-RC is an automated turret, carrying two ready-to-fire MISTRALs controlled from within the vehicle. It is equipped with day/night sensors for fire control and tracking. LIC²ORNE is a command and control (C2) unit, developed from a set of software already proven on MBDA's MISTRAL and VL MICA air defence systems. It can coordinate up to 8 ATLAS-RC systems and connect them to higher-level command systems, including using advanced connections such as Link 16 or satellite links. With its ability to use radar or electro-optic sensors, LIC²ORNE ensures that the ATLAS-RC turret has sufficient early warning to make full use of the MISTRAL’s firing envelope. Thanks to LIC2ORNE's open architecture, MBDA has been able to build in defences against mini- and micro-UAS in just a few months. These defensive systems can now protect the firing unit against terrorist actions or asymmetric attacks. “Drawing on the lessons of recent conflicts in Europe or the Middle East, the ATLAS-RC/LIC²ORNE combination is designed to provide a real air defence and engagement capability in the lower layer, while ensuring very high mobility to accompany and protect mobile detachments and front-line units. 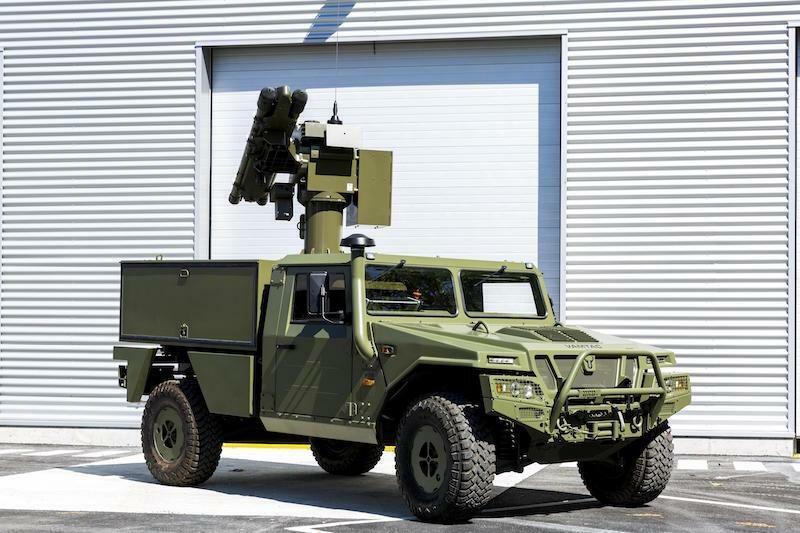 The deployment of an air defence system as close as possible to ground units is once again becoming a necessity, and a key survivability factor for ground forces,” explained MBDA’s Military Advisor, Land Systems, Francis Bordachar. MBDA presents the Atlas-RC/LIC²ORNE combination which, together with the Mistral missile, provides a substantial protection to mobile units, while fully integrated into the theatre air defence network and portable on light armoured vehicles. The Mistral is an extremely reliable fire-and-forget air defence missile, with a success rate of nearly 95%. Equipped with an infrared imaging seeker and advanced image processing capabilities, the Mistral offers excellent countermeasure resistance and can engage low thermal signature targets such as UAVs and turbojet-powered missiles at long range, in addition to the usual combat aircraft and helicopter targets. The Atlas-RC is an automated turret, carrying two ready-to-fire Mistrals and controlled from the cabin of the vehicle. It is equipped with day/night sensors for fire control and tracking. LIC²ORNE is a command and control unit, developed from a set of software components that have already been proven on MBDA's Mistral and VL MICA air defence systems. It can coordinate up to 8 Atlas-RC systems and connect them to higher-level command systems, including via advanced links such as Link 16 or satellite links. With its ability to use radar or electro-optic sensors, LIC²ORNE ensures that the Atlas-RC turret has sufficient early warning to make full use of the Mistral’s firing envelope. Thanks to LIC²ORNE's open architecture, MBDA has been able, in just a few months, to build in defences against mini and micro UAVs. These defensive systems can now protect the firing unit against terrorist actions or asymmetric commando attacks. “Drawing on the lessons of recent conflicts in Europe or the Middle East,” says Francis Bordachar, MBDA’s Military Advisor Land Systems, “the Atlas-RC/LIC²ORNE combination is designed to provide a real air defence and engagement capability in the lower layer while ensuring very high mobility to accompany and protect mobile detachments and front-line units. The deployment of an air defence system as close as possible to ground units is once again becoming a necessity, and a key survivability factor for ground forces." 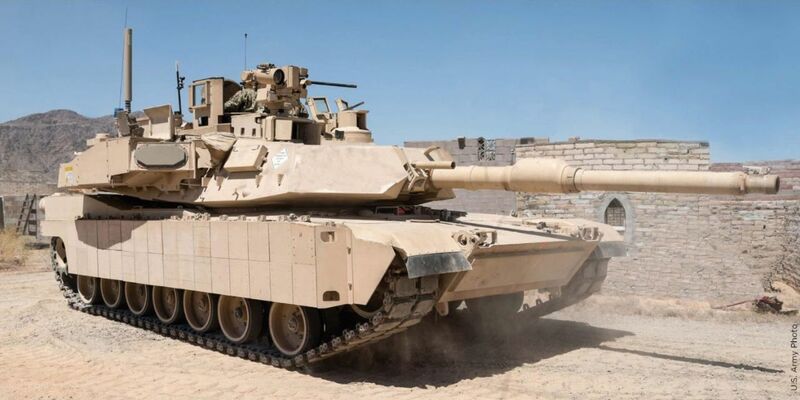 Abrams MiA2C con blindaje extra, sistema de protección activa Trophy y mejoras internas, electricas y de sensores. Mais sobre a modernização do T-64 na Ucrânia.